"The solution to light pollution" - eco-friendly down lighting is low cost and energy efficient for commercial and residential use. The Flag Company, Inc., one of the largest flag and flagpole distributors in the nation, proudly announces its newest product, the Flagpole Beacon, which is also the company's own invention. As the first true innovation in the flagpole industry in the last fifty years, the Flagpole Beacon complies with new governmental regulations regarding the prevention of light pollution and light trespass. Cities and states across the nation are adopting these regulations into law in an effort to conserve energy and to bring back a quality of life that includes being able to see stars in the night sky. Two important features of the Flagpole Beacon are that it saves energy and it reduces light pollution and light trespass. The Flagpole Beacon saves energy by using LED bulbs, a cooler light source with a longer life than regular incandescent and fluorescent bulbs. Low voltage halogen bulbs are used in some situations when more light is needed. The Flagpole Beacon's patented design reduces light pollution and light trespass by looking down at the flag from the traditional gold ball ornament. Too often, huge, hot, energy-wasting floodlights glare upward into the night sky. This outdated method shines light in a fixed beam indiscriminately pointing "up." The Flagpole Beacon, by contrast, utilizes a focused beam that lights the flag specifically and follows the flag as the wind blows it around the flagpole. This results in a more energy-efficient and cost-efficient method of lighting the flag at night, and more importantly, presents a more respectful and continual method of lighting the flag at night. The Flag Company, Inc. has a specialized division to work with general contractors, architects and government agencies on their projects with flagpoles. Flagpoles from 20' to 70' are in stock in a variety of finishes. There are Flagpole Beacon models for internal and external halyard configurations, both for commercial applications and for residential use. A solar application is available also; it is quoted on a per-job basis. The solar application is ideal for memorials, remote locations and other situations where there is no readily available power source. The Flagpole Beacon also can be retrofitted to existing flagpoles for those who want to upgrade to a more environmentally friendly light source. 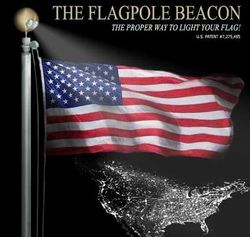 The Flagpole Beacon, U.S. Patent 7,275,495, is licensed for sale exclusively through The Flag Company, Inc. in Acworth, Georgia, a suburb of Atlanta. The Flagpole Beacon and its specifications are available through the website at http://www.flagpolewarehouse.com. The Flag Company, Inc. offers a complete range of flags and flag-related products. Custom screen printing and digital printing are available for special events, corporate logos, etc. Stock merchandise includes U.S., state, international and military flags and all types of accessories such as bunting, memorial cases, pennants and more. The Flag Company, Inc. is the nation's largest producer of message flags, offering over 300 different messages, which are used by realtors, restaurants, car dealerships and every other kind of company imaginable. Surprisingly, toothpick flags are a hot item - in stock and available for states, countries, and holidays and produced on a custom-order basis for corporations and special events. The complete product line can be viewed at the website, http://www.flagco.com.